Car enthusiasm boils down to the enjoyment of the drive. All you need is a car you enjoy, a twisty road and some exciting scenery. But the scenery aspect always seems to be left out – the natural backdrop that turns an average drive into a memory. A drive through California will remind you just how important nature is to enjoying a car, and how to make cars not adversely affect the world we live in. No, this article will not be an environmental screed if you were wondering, but it will highlight how VW and other car manufacturers are keeping the joys of motoring while taking into account the preservation of the planet. The GTI and Golf R are pretty good examples of how far automakers have pushed the envelope, balancing performance with green friendliness. Don’t be mistaken, neither of these cars are hybrids. The GTI and Golf R both share turbocharged 4 cylinder engines, but the R dials up the power and is equipped with 4Motion AWD. But it was the GTI that I took the keys to start the day. It was the early morning and everyone was scrambling to get into the car of their choice. Volkswagen had their full lineup here in San Francisco; so many journalists were trying to get into the newly revised CCs, Beetle TDIs and Golf Rs. So why did I pick the GTI? It may be three years old in its current state, but there’s something inherently right about a GTI on the roads of California. Make note that I did not say the best driver’s car though. With 200hp, and a little bit too much weight, the GTI is not a go-to canyon carver, but it is perfect for those that want to enjoy the ride instead of making it go by as quickly as possible. The GTI is composed and refined where many competitors are always antsy to go faster and harder. It may not be the fastest car when compared to the likes of the WRX of MazdaSpeed3, but it offers a balance of speed and refinement that the others lack. Also, the GTI is exemplary of how far the environmental and performance goalposts have moved since the dawn of the catalytic converter. Pulling off onto the shoulder to grab a picture of the scenery reminds you of just how large of an impact the quest for clean engines has had on the environment. My view of the rolling hills and vistas of San Francisco is clear and crisp – a nice break before taking off again. However, if this same picture was taken during the 1960s, the view I stopped at may have been covered by smog. Blankets of carbon dioxide used to coat California before the catalytic converter. Since its introduction, the clouds have lifted and the view is only halted by how far you can see, or the traditional San Francisco fog. The focus on the environment hasn’t hurt cars either. 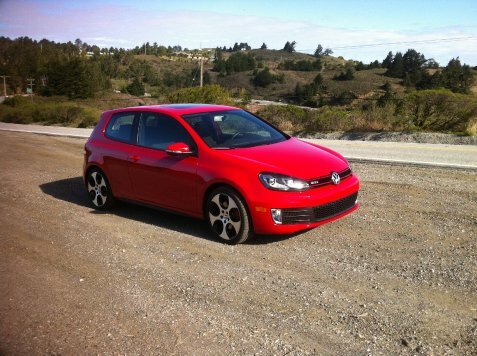 30 years ago, the GTI was introduced to the States with a little over 100hp. Today, the GTI has twice that power, all while creating fewer emissions and packed with more equipment, for around $24k. Plus, the next generation will be lighter and even more fuel efficient, bringing back the fun that the lithe original had to offer. Car guys often deride the “green” aspects of cars, but advances in technology have given us cars that are fun to drive and easy on the planet. But Volkswagen isn’t just concentrating on what is available today, but in changing the way we interact and drive our cars in the future. For instance, they recently opened the Electronics Research Laboratory (ERL) in Silicon Valley. Nestled between internet startups and technology giants, VW is taking an active role in engineering how we interact with cars and how we power them. On the technology side, it’s all about providing entertainment and usability. Here at ERL, infotainment systems, interfaces and how they work are designed and operated. Everything is done at breakneck pace in order to keep up with the market and discover new trends. For instance, the building houses a rapid prototyping room where drawings on a page are turned into a product in a matter of hours, and off to Germany to be viewed by executives shortly thereafter. Also, ERL makes sure new interfaces and gadgets don’t distract the driver. Utilizing research inside the lab with driving simulators and real world testing, ERL can see the effects that navigation systems and other infotainment devices have on customer’s driving abilities. They are even going into the future by seeing how autonomous cars affect a driver’s (can they be called a driver if they aren’t doing the driving?) reaction time in an emergency scenario. And that brings us to how VW is preparing for the future. When it comes to cars, they are covering all the bases. Today, you can by a Jetta, Passat, Beetle, Golf or Toureg with a diesel engine. VW is known for their diesels, though, and is the largest seller of diesel-equipped cars in the U.S. However, you can also buy a hybrid from VW in the form of a Toureg, or later this year in a Jetta. You can even buy a purely electric Golf in 2014. Beyond that, all bets are off. VW is looking into concepts such as the XL1, which combines a twin-cylinder diesel engine and hybrid drive for nearly 200+ MPG. VW is also harnessing the creative energy of Silicon Valley to help in their crusade for fun, economical cars as well. For example, VW is currently teaming up with two renewable oil suppliers, Solazyme and Amyris, by giving them a diesel Passat and Jetta to test their renewable diesel fuel. You may have heard about this type of fuel in the news. Newt Gingrich, the man who wants to put a base on the moon, thought it was a preposterous idea. However, unlike a moon base, this new diesel is ready to go today. How it works is that sugarcane, corn, grass and even forest residues are put in a fermenter with Algae. The algae consume the sugar, corn, etc. and the output is ready to use diesel fuel; no additives needed. The benefits of this process are that nothing needs to be drilled out of the ground, such as oil or lithium for batteries. Also, the gas can be used with existing engine technologies and can also be manipulated to reproduce many oil-based plastic. For us car guys, it means the internal combustion engine sticks around for a good while longer. Automakers have made great strides in making cars that are both environmentally responsible and fun to drive. VW is no exception. From their early leadership position on diesels since the 1970s, to the cutting edge of environmental tech for tomorrow, Volkswagen is making sure that we will be driving exciting cars for a very long time. Meanwhile, the GTI and Golf R are plenty enough to keep the good times rolling until that future gets here. The Volkswagen Van is Making a Comeback!